No Comments on AndyVent Calendar 5 Winners Announced! No Comments on An AndyVent Calendar Thank-You! God bless her! This was the very last thing Joan did as an Eastlink Volunteer. She finished up taping her final season of “Welcome To My Kitchen” and was kind enough to do this for the AndyVent Campaign. Many thanks to the folks at Eastlink for making this happen and for making this true fan-boys dream come true. No Comments on The AndyVent Calendar 5: Feed The Need! December 1st isn’t that far away. One final thanks to everyone for the continued support of the Calendar Campaign! I can’t say enough good things about our local businesses who donate terrific prizes to this cause while also being extremely supportive & encouraging behind the scenes. Without them, there would be no AndyVent. ^click for larger image of all the amazing prize contributors! Thanks again to AndyVent elves, Katy (for handling all things Facebook) and Arthur at Halifax ReTales (for site hosting again this year. So another big congrats to Grand Prize Winner, Amy & Matt Spurway! And Runner Up Prize Winner: Ian McGrath! No Comments on AndyVent 4: Recap! No Comments on AndyVent 4 Calendar Winners Announced! No Comments on The AndyVent Calendar 4: Thank-you! THIS IS IT, KIDS! DEADLINE TO ENTER IS TONIGHT! Day 1: $120 in tickets (2) to upcoming Matt Mays concert in Halifax from Sonic Concerts. Day 2: $50 gift card from Krave Burger. Day 3: $240 in free Donuts (1 year supply) from Ol’ School Donuts. Day 4: $140 Floatation Package from The Floatation Centre. Day 5: $100 Swag Bag ($50 gift certificate, ball cap, water bottle, shirt) from Salvatore’s Pizzaiolo Trattoria. Day 6: $75 gift card from The Wooden Monkey. Day 7: $100 in NSLC gift cards from Greener Inspections. 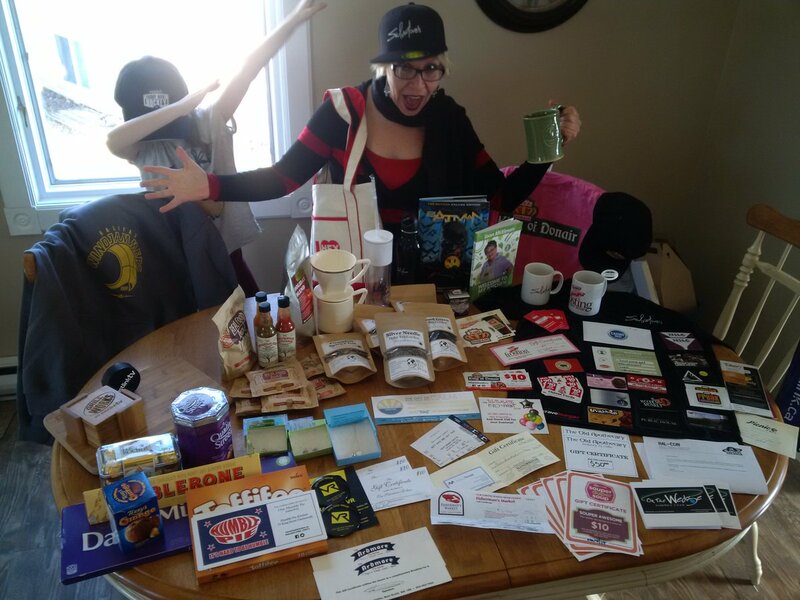 Day 9: $160 Sack-tacular Saturday Prize Pack from Sackville Drive businesses includes a pizza party at Freeman’s Little New York ($100 value), Graphic Novel from Cape & Cowl Comics & Collectibles ($40) and Balloon Bouquet certificate from The Ultimate Party & Event Store ($25)! Day 10: $100 gift card from Bishop’s Cellar. Day 11: $122 Meat, Heat & Sweets Pack: $50 Boneheads BBQ gift card, $40 hot sauce trilogy from Canning Sauce Company and 12 free cupcakes ($32) from Susie’s Shortbreads! Day 12: $90 Candy-palooza from Freak Lunchbox (2 x $20 gift cards) and Dartmouth Gate Guardian ($50 in assorted chocolates). Day 13: $140 Carbs Diem! Prize Pack from Souper Duper Soup ($50 in gift certificates), Made With Local ($50 box of good for you goodies) & Frosting Cake & Event Design ($25 gift certificate and coffee mug). Day 14: $100 gift certificate from Manorhouse Furniture. Day 15: TGIP! It’s a MEGA $250 Pizza Pack from Pizzatown Sackville ($100 in gift cards) King Of Donair ($75 swag bag) and On The Wedge Gourmet Pizza ($75 in gift certificates). Day 17: $140 Uncommon Prize Pack from Sugah! ( 1 x tub of Moon Mist), Lost Cod Clothing Co. (1 x hoodie) and Uncommon Grounds (1 x coffee/pour over brewer). Day 18: $120 Prize pack from World Tea House. Day 19: $100 Millstone Public House gift certificate from BritChick Social Media. Day 20: $50 gift certificate from Fisherman’s Market and $75 in vouchers from Casino Taxi. Day 22: $110 Beer & Bling Prize Pack from Good Robot Brewing Co. ($25 gift card), Unfiltered Brewing ($25 gift card) and $60 in jewelry from Kissed By The Sea. Day 24: $75 Welcome To My Prize Pack Swag Bag from Eastlink TV.